I am sorry to those people who have been to my blog recently and there seems to be some weird things happening, but I have been playing! I have been unhappy with the amount of time it takes blogger to upload images, and thought it was about time I visited Chookyblue...yet again...for her helpful tute on emailing pics to your posts. Its so much quicker doing it this way! I could only ever post 3 pics at a time before...so you might find I have a few picture heavey posts from now on!lol! 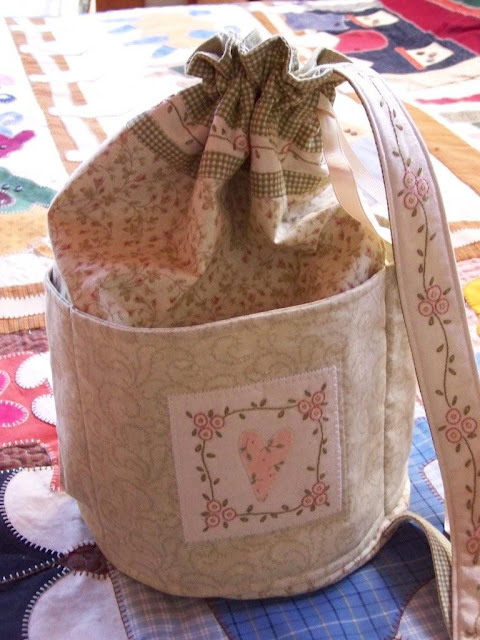 This is a picture of a bag I made in my pre-blog days...a Bareroots pattern from Country Threads, which I gave to my Mum...she has quite a collection of my bags too!lol! Another really cold day here...I hope where ever you are, that you are staying warm and getting lots of sewing done! Gorgeous bag Lisa and I think I will have to visit Chookyblue's site. My photos take ages to upload too. I love this little bag. Looks like it has lots of compartments. I especially like how you have done the handle with the vine trailing along it. Your bag is beautiful. I've been enjoying seeing your hexies come together over past posts. So lovely! Now I'm off to visit Chookyblue (again) and see if I can also speed up this process. I'm put off blogging a little because is find SO time consuming although I love it and really should be more consistent. beautiful bag, I am sure your Mum is so happy with it. Hi Lisa, Your bag is just lovely, and a girl can't have too many bags I reckon! Kind regards, Anita. Love this bag.... I'm going to look at making a mug bag for myself very soon.